With the rise of synthetic marijuana products, also known as spice or K2, many employers and hiring agencies are understandably concerned with how they will detect the use of such drugs. Despite synthetic marijuana being marketed as “safe” and legal, neither of those claims are true. Spice is a psychoactive herbal and chemical product that mimics the effects of marijuana and has the potential to be very harmful causing an array of mental problems. Because of this, it’s important for an employer to ensure that employees and job candidates are not using spice. The common assumption has been that the drug is difficult to detect using standard drug tests, and this is one key reason why there has been an increase in the consumption of spice in recent years. 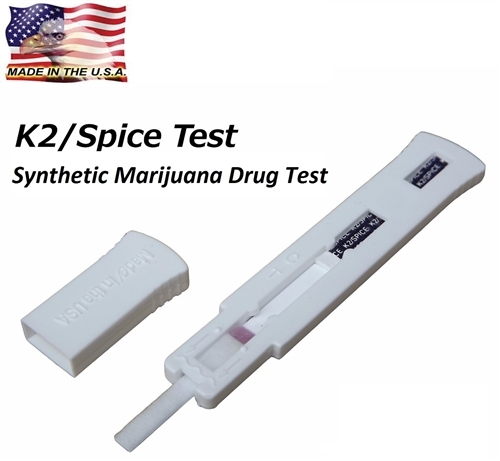 Medical Disposables K2 / Spice Drug Test is an alternative to the traditional cannabis urine test. The K2/Spice Test is based on a specific immunochemical reaction between antibodies and antigens. The K2/ Spice Drug Test is designed to detect the chemicals used in synthetic marijuana using the same methods that have proven to be effective in the detection of cannabis. The test itself detects synthetic cannabis JWH-018 and JWH-073’s major metabolites in human urine at levels of 25ng/ml. – This is why multiple components and compounds must be tested for synthetic marijuana, it is more complex than standard cannabis. Medical Disposables is known for their high-quality cannabis urine test products, and their new synthetic marijuana drug test is no exception. It is one of the most sensitive laboratory tests on the market, designed to detect even the slightest presence of the chemical compounds used in spice. The Medical Disposables spice drug test is capable of detecting 16 different chemicals that are known to be used in the creation of synthetic marijuana. When any of these chemicals are present in the urine specimen, they compete with drug conjugate for a limited amount of antibody-dye conjugate. When the amount of drug is equal or more than the cut-off it will not show a colored band on the test line zone, indicating a positive result, while the presence of a colored band indicates a negative result. The tests are accurate enough to provide results up to seven days after retrieving a properly stored urine sample. Medical Disposables K2 drug test makes it quick and easy to discover whether or not synthetic marijuana has been consumed. It can be used in conjunction with other tests, or on its own. The K2 drug test is a urinalysis test, only takes a few minutes to complete, and is extremely user-friendly. Once the urine specimen has been retrieved, the lab technician simply removes the protective cap and holds the dipstick in the urine sample for 15 seconds. Once the appropriate amount of time has lapsed, the technician replaces the cap and lays the tester on a flat surface. After five minutes, the results will be revealed in the result window on the side of the tester. The Medical Disposables K2 / Spice Drug Test will provide a positive, negative, or invalid result. With the Medical Disposables K2 / Spice Drug Kit you can rest assured that your workplace is completely drug free. how long will spice stay in your system? how far back will this test be accurate?